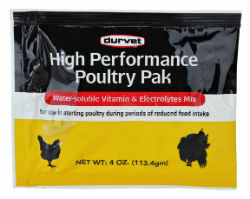 Water soluble vitamin and electrolytes mix for use in starting poultry during periods of reduced feed intake. Convenient, pre-measured paks. Concentrated formulation to reduce handling cost. Complete balanced vitamin package for growing birds. Mix fresh solution daily. Automatic watering system add the following amount to two gallons of stock solution when proportioner is set to meter at the rate of one ounce per gallon. Vitamin A supplement, Vitamin D3 supplement, Vitamin E supplement, vitamin B12 supplement, Riboflavin, D-Calcium Pantothenate, Niacin supplement, Menadione Sodium Bisulfite Complex, Pyridozine Hydrochloride, thiamine Mononitrate, Folic Acid, Biotin, Ascorbic Acid, Potassium Chloride, Sodium chloride, Magnesium Sulfate, Iron Sulfate, Zine Methionine Complex, Manganese Methionine Complex, Copper Sulfate, Sodium Saccharin and artificial flavoring.